Academy Award-winner Meryl Streep (KRAMER VS. KRAMER, DEER HUNTER, MANHATTAN), whose attractive features and unique ability to portray a character have made her the most popular actress in America, plays the worldly and mysterious Sarah Woodruff in the film based on the brilliant best-selling novel by John Fowles. Directed by Karl Reisz (THE GAMBLER, WHO'LL STOP THE RAIN), from the screenplay by Harold Pinter, THE FRENCH LIEUTENANT'S WOMAN is at once a classic Victorian love story and an ironic look at an age of double-standard morality. Sarah Woodruff's chance meeting with Charles Smithson (Jeremy Irons), a young man-about-town who subsequently discards his pretty young fiancee in a wave of passion, sets into motion a series of events that disrupts the quiet fishing and seaside village in England and profoundly affects the lives of its residents. In addition to the excellent performances, THE FRENCH LIEUTENANT'S WOMAN is beautifully photographed (Freddie Francis, THE ELEPHANT MAN) and is a totally authentic film of romance in Victorian England. 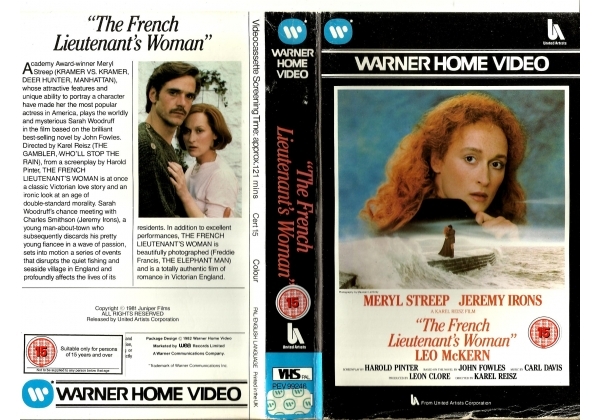 Or find "French Lieutenant's Woman, The" on VHS and DVD / BluRay at Amazon.